Alexander Caulfield Anderson spent a number of years in the New Caledonia district, the portion of the Columbia district that included Fort Alexandria on the Fraser River (north of Williams Lake), Fort George (Prince George), and Fort St James and its satellite posts. Anderson arrived in the district in 1835 and left it again in 1840 — via the old brigade trail through Kamloops and the Okanagan Valley. When he returned to Fort Alexandria in 1842, he would come in by the new trail, and the old trail would disappear within a few years. 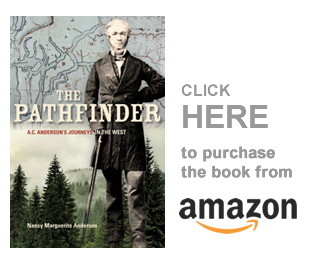 The trail disappeared so quickly that Anderson did not even show it on his maps. But he did draw in the old trails around the Okanagan Valley, and these maps are referenced by all the fur trade researchers who want to locate the brigade trails — and there are many. So, what I am going to do in this series of posts is tell you about the old brigade trail over the Thompson plateau, so you can see for yourselves the difficulties that these fur traders experienced. The fur traders began their journey every year from Fort St. James, Stuart’s Lake. They were taking out their furs and they would return home with their trade goods for the next year. Let’s begin with a short history of this area — both Stuart’s Lake and Fraser’s Lake were named for the first two explorers, Simon Fraser and John Stuart, who ventured into this territory in 1807 and who later paddled their way down the Fraser River to its mouth. McLeod Lake (sometimes called Trout Lake and here called Fort Simpson), was named for an earlier North West Company fur trader named Archibald Norman McLeod — a fascinating man about whom little is known. But that is neither here nor there — for now we are speaking of the New Caledonia brigades that left Stuart’s Lake every summer and made their way south to Fort Vancouver, on the lower Columbia River. This section of the New Caledonia brigade posts will only take us from Fort St. James to Fort George [Prince George], on the Fraser River. William Connolly and James Douglas were the first to bring out their furs over what became The Brigade Trail. This was the first journey over the trail, and it remained in use until 1842. In 1843 a new trail cut off the section of road over the Thompson plateau between Drowned Horse Lake and Kamloops. 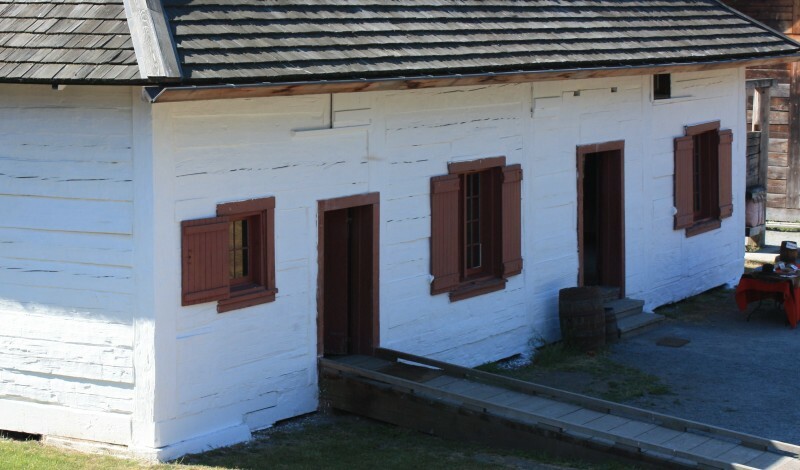 In 1848 the brigades abandoned their Columbia River route entirely, and made their way to Fort Langley, on the lower Fraser River, from Kamloops. These journals will not touch those later routes — they follow the original brigade trail south via the Okanagan River and the Columbia. So, this is William Connolly’s 1826 journal of his journal from Fort St. James, Stuart’s Lake, to Fort Vancouver on the lower Columbia River, via the old brigade trail. [B.188/a/8, HBCA] This journal is edited for clarity and punctuation. “The brigades Consisting of three Canoes, were dispatched for [Fort] Alexandria on the 3rd Instant [May]. And myself with Mr. [James] Douglas (who is to accompany me to the Columbia) embarked from Stuarts Lake at one o’clock PM to proceed to the same place. The weather was fine and we encamped at half after seven PM in Stuart’s River. The water is very low, None of the Snow in the Mountains being yet dissolved, and the Current is therefore not strong, and our progress, altho’ we have a crew of nine men, is not so great as might be expected. “6th, Saturday. At half after two AM, we left our Encampment and passed the Forks formed by the Junction of the two Rivers which flow from Stuart’s & Fraser’s Lakes, at a quarter past twelve, and Encamped below the rapids of Chala oo chicks at half an hour after 7. The weather was fine. “Saturday [May] 7. Everything being settled & instructions given to Mr. [Thomas] Dears for his Conduct during the summer & the transports to be effected of 1,800 salmon from Frasers Lake which are to be sent to McLeod’s Lake as a Stock for that Post and provisions for the Party that will go for Leather in the Fall to Peace River, I embarked at 1 pm with 7 men & the remaining Packs and Leather to be taken down for the Lower Posts. Towards Evening we saw Ahtshesil, Quau’s second son who gave us 2 bustards [Canada geese]. Encamped at 8 PM. “Sunday 8. Started at an Early hour and got to Chinlac Forks, where the Canoes got down safe — also the Bateau [sic] & Canoe from Fraser’s Lake, accompanied by [Etienne] Roi & 2 Indians in a Wooden Canoe who is to take up any property that Mr. [Alexander] Fisher may have sent from [Fort] Alexandria for those posts which are short of Ammunition & Tobacco. Here I received a letter from Jean Baptiste Bouche stating that previous to sending off the Returns and Provisions now here, he had Counted the Stock of Salmon on hand which he says is 3400. That Quantity, far from affording the Supply required for McLeod’s Lake is not Sufficient to Subsist the Establishment and the Dogs sent there for the summer, say 24 Dogs. This is a deficiency no ways Expected & never mentioned by Mr. Dears when spoken to on the subject of getting that Quantity brought from there, which is rather astonishing as he should know the Contents of the Store. This will cause a derangement by obliging us to get what will be required from Babines instead of Fraser’s Lake. The Canoes being Gummed & loadings given out, Embarked at 4 PM, after having received a few furrs [sic] from Deh [Native] & 3 young men, & proceeded to the head of Stony Island Rapids where we put up for the night. Copyright Nancy Marguerite Anderson, 2014. Corrected, May 2016. All rights reserved.